Recently, I have become a little obsessed with Deborah Lippmann's polishes. I am starting to love everything about them, from the stable, signature square bottle, to the shape of the handle, that fits perfectly between your fingers for maximum control, to the color range. In the past month alone, I think I've picked up 10 new Lippmanns. :| Thankfully for my wallet, most of them were either acquired from the clearance sale on HSN or by using my Apothica.com giftcard (which I receive as part of my site sponsorship with Apothica). Daytripper is a bright melon jelly-ish creme. 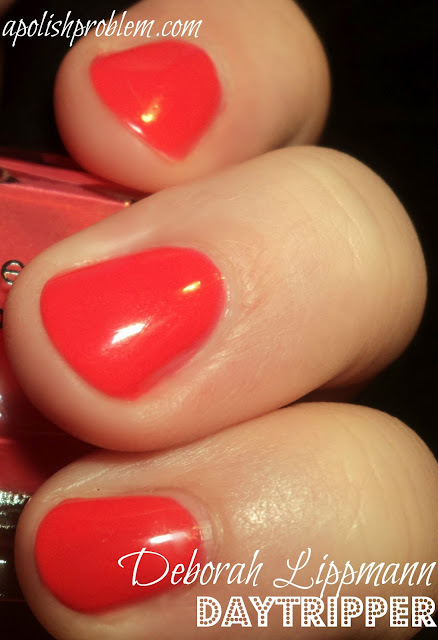 The finish and formula on this one was very similar to that of the OPI sorbet polishes from last year's Texas collection. Because of this, it took 4 coats to reach opacity on this one. After the third coat, I still had a few thin spots, so when I had to apply that fourth coat, I got very worried that it would remain gooey on my nail and wouldn't dry. However, after one coat of Sally Hansen Insta-Dri, it was completely dry in about 20-25 minutes. So, this is one of those polishes that can handle several coats, if necessary. The color on this one is so pretty, and I actually think it's unique in my collection. At first, I thought it was going to be too warm for me, but after putting it on, I see that it has just the right balance of peach and pink for just about every skin tone. I think it is a perfect color for summer. 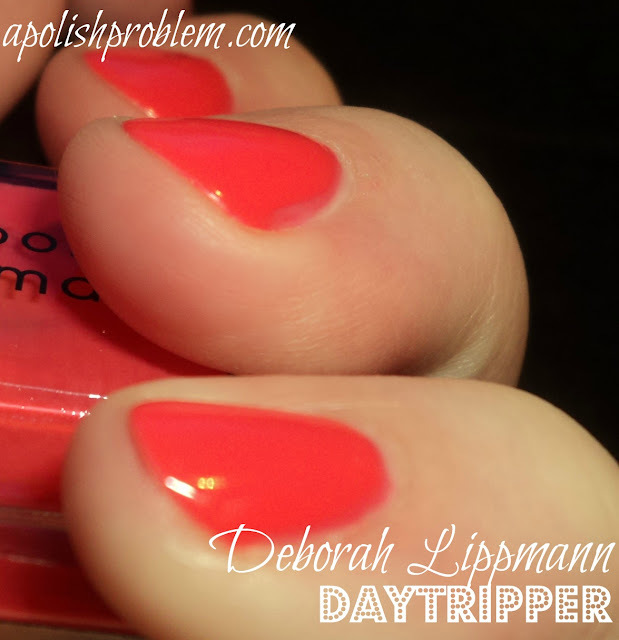 Deborah Lippmann Daytripper is a part of her regular line-up and should be available anywhere you find Deborah Lippmann polishes. I always get my Lippmanns online and my favorite places to purchase them are Apothica.com, Zappos, and What She Buys. Daytripper was purchased by me using an Apothica.com gift card that I received as part of my sponsorship agreement with Apothica. The above links link to various sites to purchase this product and are not affiliate links. And that brand sims to be really good!